We're coming to the close of September, which means Fall is officially kicking off. Next month is the appropriate time to start putting up Halloween decorations AND NOT THE BEGINNING OF AUGUST, CONVENIENCE STORES!!! 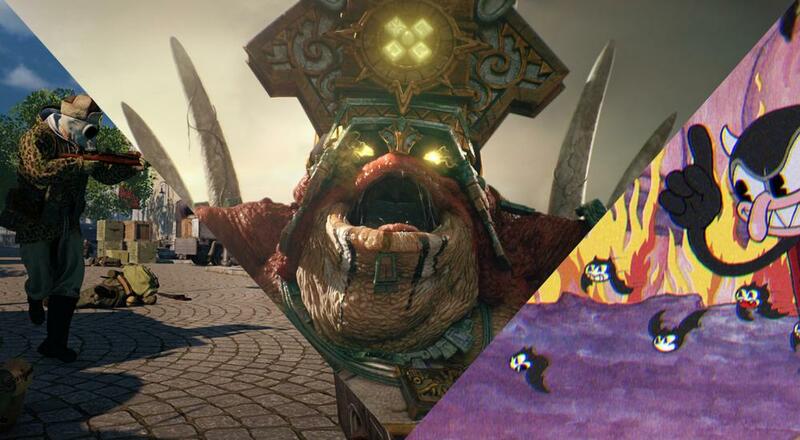 Anyways, there are a handful of co-op title releases this week, like Cuphead and Total War: WARHAMMER 2, as well as the arrival of the SNES Classic and the final DLC for Nioh. RAID: World War II (PC, consoles later) - supports four player online co-op. This WWII FPS takes the DNA of PAYDAY 2 and applies a different sort of formula to it. Rather than "Saving Private Ryan," you and your crew are out to loot as much from the Nazis as you can. Available today on PC via Steam, and on October 10, 2017 for PlayStation 4 and Xbox One. Sine Mora EX (Nintendo Switch) - two player local co-op through the campaign. This unique shmup makes its way onto the Switch. Available today via the Nintendo eShop. Total War: WARHAMMER 2 (PC) - supports two player online co-op in the main story campaign (both players play as the same faction, or players choose separate factions and then form an alliance) and two player online co-op in the multiplayer mode (comp stomp). A new narrative campaign, set across the vast continents of Lustria, Ulthuan, Naggaroth and the Southlands. The Great Vortex Campaign builds pace to culminate in a definitive and climactic endgame, an experience unlike any other Total War title to date. Available Thursday, September 28 on PC via Steam. Cuphead (PC, Xbox One) - supports two player local co-op throughout the campaign. Cuphead and Mugman rolled the dice and lost to the Devil. Now they have to repay their debt by doing his bidding! Cuphead is a classic run and gun action game heavily focused on boss battles, and inspired by cartoons of the 1930s. Available Friday, September 29 on PC via Steam or GOG.com, and on Xbox One/Windows 10 via the Microsoft Store as an Xbox Play Anywhere title. Halo Wars 2: Awakening the Nightmare Expansion (Windows 10 and Xbox One) - supports three player online co-op through the base game story campaign, and in a variety of game modes, like Firefight. This DLC adds a new enemy faction (the Flood) and a new co-op Terminus Firefight mode, as well as some new campaign missions that are, sadly, single-player only. Available today via the Microsoft Store. Nioh: Bloodshed's End Expansion (PlayStation 4) - supports two player online co-op in certain missions, though playing with specific friends requires one person to have cleared the mission on their own and then be summoned into the other person's game. The final DLC for Nioh concludes the story of protagonist William and sees the end of the Edo period. New missions, new weapons, and a new mode (Abyss) are all added to the game. Available today via the PSN Store. SNES Classic Edition - two player local co-op in a number of games. Similar to the NES Classic Edition, Nintendo has bundled together 21 classic SNES titles, like Secret of Mana, Star Fox, and The Legend of Zelda: A Link to the Past, and put them into one mini console that comes with two controllers and an HDMI cable to hook up to modern TVs. Pre-orders came and went for this much sought after item, but stores like Toys R Us, Target, and Best Buy should have some in the stores themselves. Good luck! Page created in 1.1219 seconds.